The unemployment rate for the 15–64 age group stood at 3.7% in January 2019, only 0.2ppt down on the rate a year ago. Taking seasonality into account, for nine months the unemployment rate has been stable around recent levels, at roughly 170k unemployed. The number of employed people remains above 4.4 million. All labour market indicators are suggesting that the Hungarian labour market has reached its peak. The only significant improvement we can highlight is the decreasing number of fostered workers (who work in state-financed, low skilled jobs) and the increasing number of workers in the primary labour market. However, this trend is unlikely to see much improvement going forward. 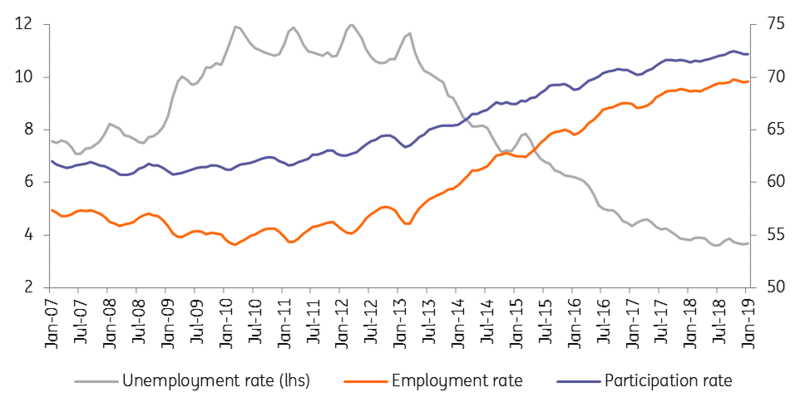 Against this backdrop we see the unemployment (and employment) rates hovering around recent levels for the remainder of the year. With supply side issues on the labour market becoming increasingly acute, this might further fuel wage growth . This will also push companies to increase capital expenditure, so enhancing productivity.